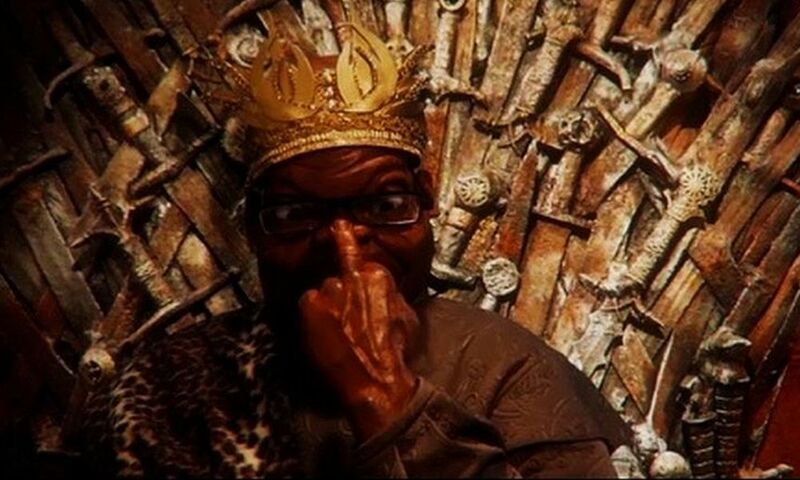 SOUTH AFRICAN POLITICS, OFTEN BORDERING ON THE FARCICAL, PROVIDES A FERTILE SOURCE OF MATERIAL FOR COMEDIANS. YOU CAN’T MAKE MOST OF THIS STUFF UP. 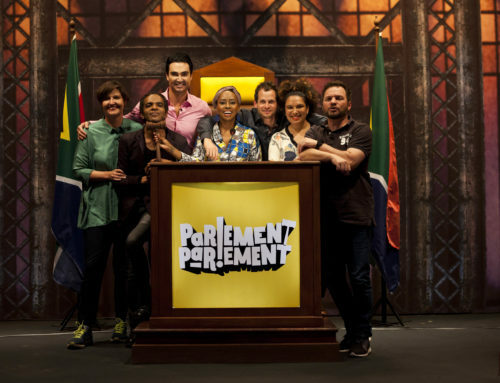 And the shenanigans in Parliament inspired Both Worlds’ comedy panel show, Point Of Order and its Afrikaans version, Parlement Parlement. 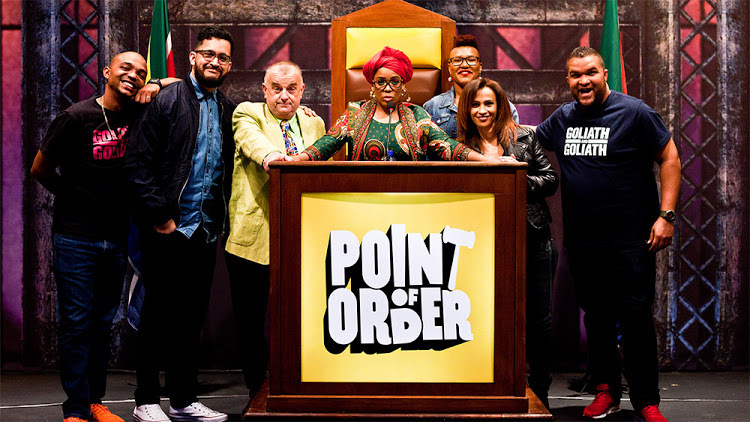 Winner of the 2017 Safta (SA Film And Television Awards) for Best Game Show, the first two seasons of Point Of Order have been acquired by Showmax and are now streaming on the platform after previously being available on StarSat. Two additional seasons will roll out later, depending on how well it performs with viewers. With Best TV Presenter Safta-nominee and Comics Choice Comic of the Year Tumi Morake as Madam Speaker, “government” and “opposition” panels comprise a rotation of comedians including Nik Rabinowitz, Joey Rasdien, Sne Dladla, Ebenhaezer Dibakwane and Yaaseen Barnes, who each bring their own views of the political landscape and life in general to the table to explore the very South African issues under debate. Comedy is incredibly subjective, but having these varied personalities interpreting events means viewers are more likely to relate to at least one of them, even if it’s the first time they’re being exposed to that particular comedian. And that can lead to supporting live comedy outside the home and the comfort zone – a win for everyone. A combination of researched scripted segments – because it is dealing with real laws – and “freestyling”, Point Of Order tests comedians’ ability to think on their feet and improvise, and includes a segment called “Talking K* K”, which Barnes says is the scariest part of the show for him. “That’s also where the selection of comedians comes from the people on the panel are those who’ve been doing it for a while, been grinding at it. And if we can’t think fast, at least we can still make it look funny,” he says. Although the Point Of Order seasons were filmed between 2015 and 2016, the content still remains relevant, says Karen Jeynes, the head writer on all Both Worlds’ shows. 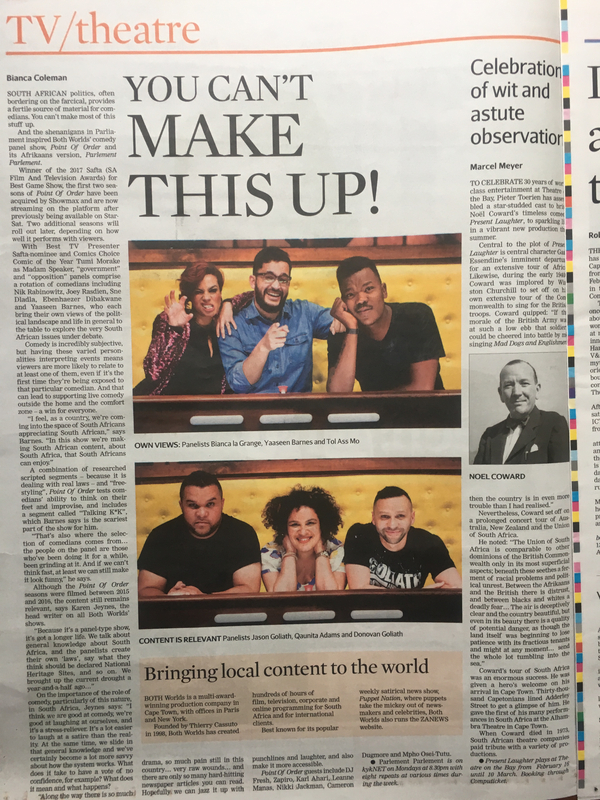 On the importance of the role of comedy, particularly of this nature, in South Africa, Jeynes says: “I think we are good at comedy, we’re good at laughing at ourselves, and it’s a stress-reliever. It’s a lot easier to laugh at a satire than the reality. At the same time, we slide in that general knowledge and we’ve certainly become a lot more savvy about how the system works. 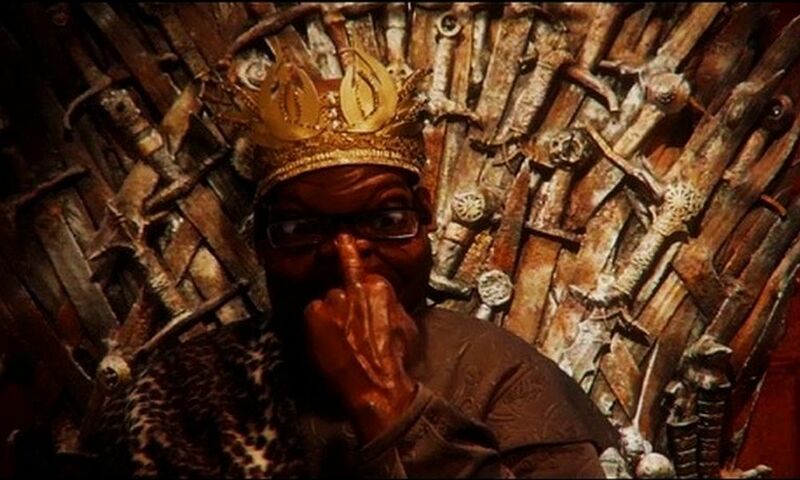 What does it take to have a vote of no confidence, for example? What does it mean and what happens? “Along the way there is so much drama, so much pain still in this country very raw wounds and there are only so many hard-hitting newspaper articles you can read. Hopefully we can jazz it up with punchlines and laughter, and also make it more accessible. 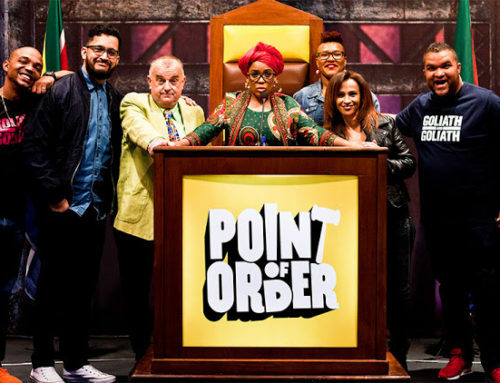 Point Of Order guests include DJ Fresh, Zapiro, Karl Ahari, Leanne Manas, Nikki Jackman, Cameron Dugmore and Mpho Osei-Tutu. 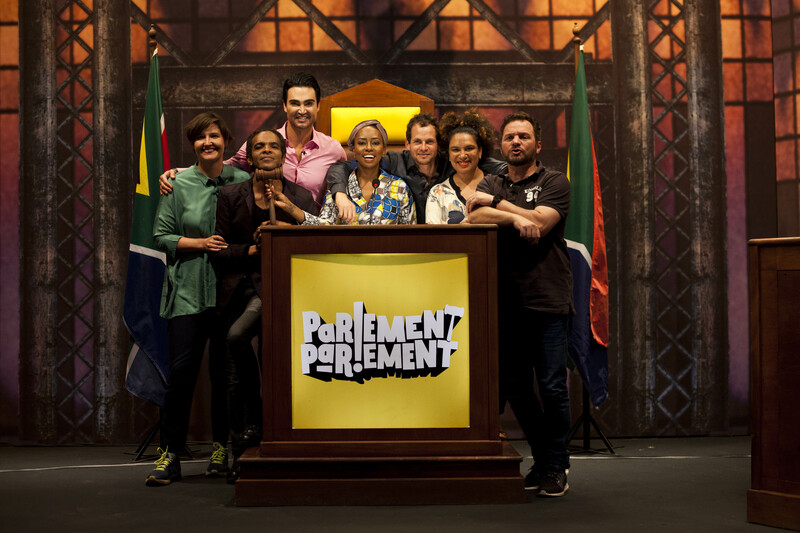 * Parlement Parlement is on kykNET on Mondays at 8.30pm with eight repeats at various times during the week. 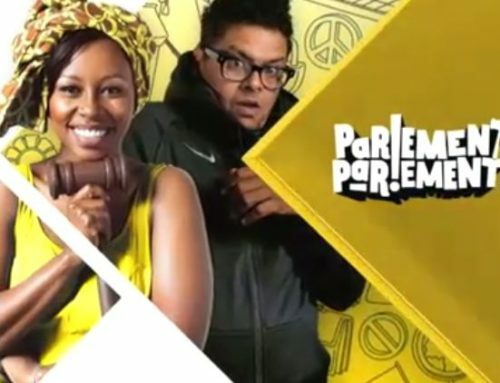 Nuwe Parlement Parlement Seisoen 2 Episode 2 Uit Vanaand! January 15th, 2018|Comments Off on Nuwe Parlement Parlement Seisoen 2 Episode 2 Uit Vanaand!